If I use something that is translucent, it is still possible to see the weavings as they run/flow in and out of the holes in lower layers. This is a better direction, and closer to what I was thinking about with some of the earlier ones. 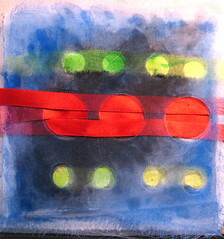 I used 3 layers of silk organza painted with Dynaflow – a very loose fabric paint that leaves the weave open and flexible. I used the twill to sop up the extra paint, and it looked so integrated that I added it as a bottom layer, to give the eye a stopping point. I could use layers with more visual heft, and only have two. The organza is very wifty.